There aren’t that many things that I like more than Kimchi and eggs in this world. Especially when I am hungover and craving something rich, spicy and refreshing at the same time. If I come home tipsy and I know that I will have a hangover the next day, I head to the kitchen and make myself a Kimchi omelette no matter how late it is. It makes me wake up with a puffy face but it also keeps me from having a splitting headache and nausea. I don’t know whether Kimchi actually cures the hangover or our brains and stomachs are just programmed that way but Kimchi is one of the most common food eaten for hangover in Korea. 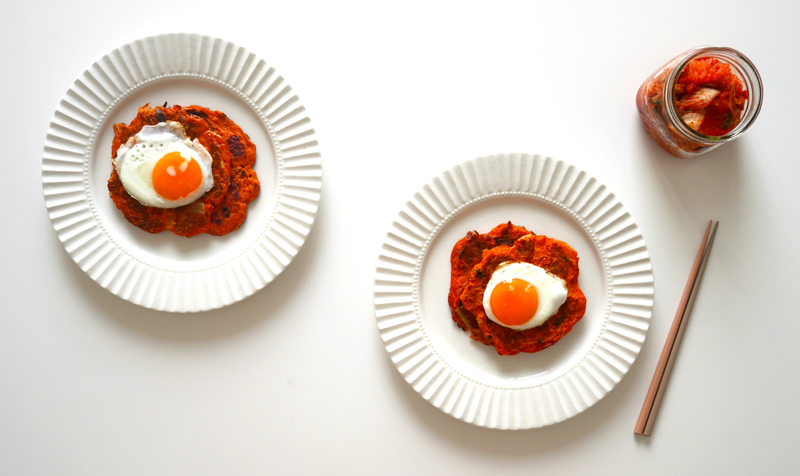 (As you could probably guess, we eat Kimchi for almost anything). 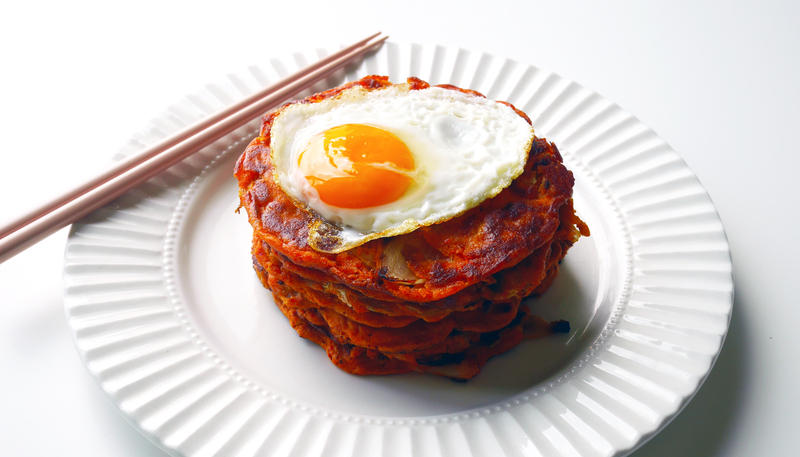 If I forget to have a Kimchi omelette before bed and wake up feeling like a zombie, Kimchi pancake is one of the dishes that I crave specifically with rich egg yolk. Sift barley flour and baking powder into a bowl. Mix in Kimchi with its juice, water and an egg. Heat a lightly oiled non-stick frying pan over medium heat. Scoop over a small amount of batter (a little less than a ladleful per pancake) onto the pan. Cook for 3-4 minutes on each side or until golden and crispy. You will end up with 6-7 pancakes in total, depending on how much you eat while making them ;-). Make sunny side-up eggs and serve with pancakes. OMG, this looks amazing. I want this. That looks beautiful. I haven’t heard of Kimchi for hangovers lol only about 육개장 or a few other spicy soups! Hi Jin – I’m still to try kimchi but have heard of is health benefits – and of course the hangover cure is a huge bonus! It really is a wonderful thing 😉 Hope you get to try it soon! If you buy a pack from supermarket, make sure to close the lid tightly to store, probably glasslock container is the safest option.